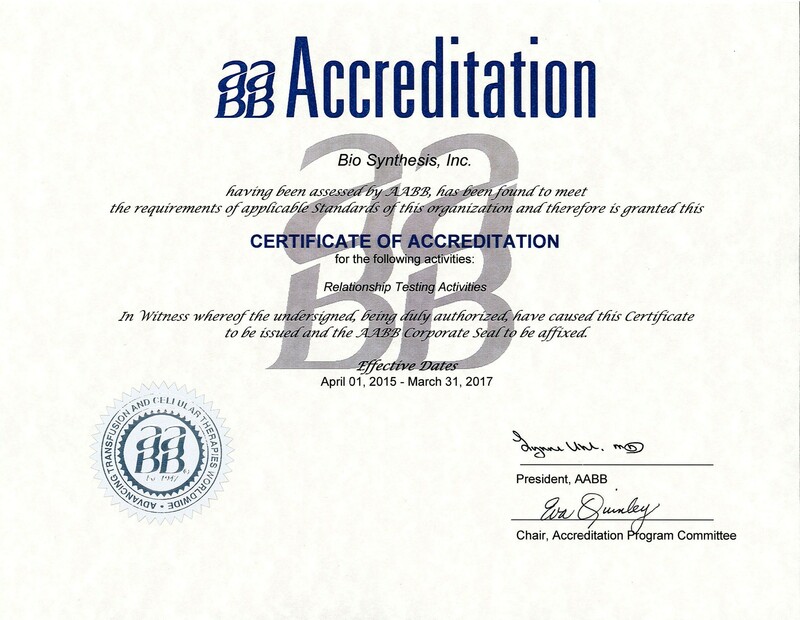 The DNA Identity Testing Laboratory of Bio-Synthesis, Inc. is accredited by the AABB, Advancing Cellular Transfusions and Therapies Worldwide. We offer many types of DNA tests, including paternity tests, familial relationship tests, DNA profiling, DNA banking and more. We currently work with clients involved in paternity disputes, child custody, immigration claims, inheritance, adoption and even infidelity. As an established laboratory, with over twenty years of experience, we are sensitive to the needs and desires that people may face when seeking our services. We believe in not only providing accurate and confidential DNA testing, but also in supplying excellent customer service. Our team of case consultants is dedicated to serving each client with the utmost respect and care. The DNA Identity Testing Center of Bio-Synthesis, Inc. is equipped with the most current automated and fluorescent imaging technology. This state-of-the-art instrumentation allows us to perform high-resolution DNA-based identity testing while adhering to the strictest of quality-control and quality-assurance guidelines of regulatory agencies. In exceeding these guidelines, Bio-Synthesis, Inc. ensures that all legal laboratory work performed by the DNA Identity Testing Center will be admissible in a court of law. We perform an advanced analysis of 13-16 genetic markers including amelogenin, the gender-determining marker. We are capable of running up to 20 loci when needed, e.g. a reconstruction case or motherless case. Routine quality-control measures are used to evaluate each test. Thus, Bio-Synthesis, Inc. ensures a probability of paternity up to 99.9+% for inclusions and 100% accuracy for exclusions, which are confirmed twice. For all other familial DNA testing, results may vary from <1% to >99% accuracy. Currently, Bio-Synthesis, Inc. guarantees that a test’s results will be available in five to seven working days after receiving all samples and fees. Bio-Synthesis, Inc. strongly believes in maintaining strict confidentiality. All communications between our staff and clients are held in the strictest of confidence. Results are never given by phone and are only sent to the tested individuals or those representing them. Therefore, we ensure privacy for all involved. Bio-Synthesis, Inc. feels confident that you will be impressed by the overall quality and service that we can provide you. We are ready to be of assistance to you in any way possible. Should you have any questions or concerns regarding the DNA testing services that we offer, please feel free to contact us.